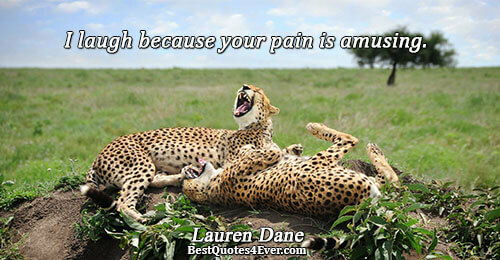 I laugh because your pain is amusing. Free your mind of that which you have no control. It is not only good to do so for your mental, but your overall health. Some people must learn from experience. You can convey knowledge to them and offer to show them the way. But, that doesn't mean your wisdom will be accepted or appreciated. All the kids with fancy shoes or clothes, do you know what I got with a family of nine? When ever we said let's play poker, we had a full team of adults right there. Words. Just little black marks on paper. Just sounds in the empty air. But think of the power they have! They can make you laugh or cry, love or hate, fight or run away. They can heal or hurt. They even come to look and sound like what they mean. Angry looks angry on the page. Ugly sounds ugly when you say it. I like joy; I want to be joyous. I want to smile and I want to make people laugh. And that`s all I want. I like being happy. I want to make others happy. 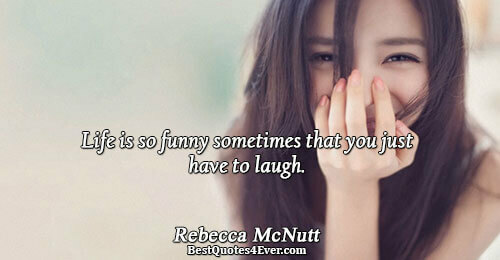 Because when you’re laughing, there is no other emotion in that moment except for joy. 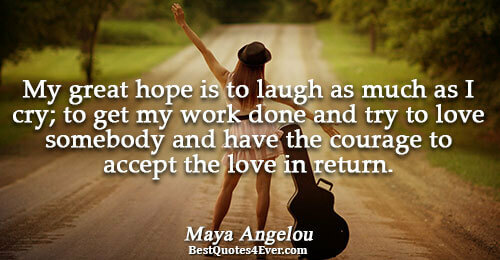 Through all of living have much joy and laughter, life is to be enjoyed, not just endured. Life is a jest of the Gods and there is no justice. You must learn to laugh… or else you'll weep yourself to death. You stay safe, You love. You survive. You laugh and cry and struggle and sometimes you fail and sometimes you succeed. You Push. If you don't learn to laugh at life it'll surely kill you, that I know. 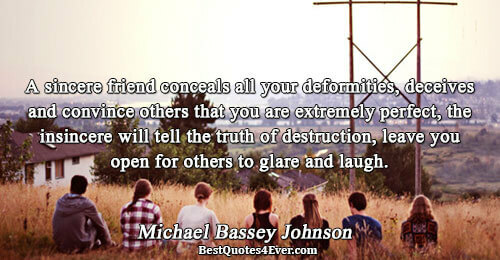 A sincere friend conceals all your deformities, deceives and convince others that you are extremely perfect, the insincere will tell the truth of destruction, leave you open for others to glare and laugh. Make her smile, make her laugh and make her happy; because this is the only Truth, Meaning & Beauty act any human can ever achieve. There were times when I lifted my face to the sky, stretched my arms wide to the winter night, and laughed out loud, so happy was I. The memory of it makes me laugh now, but not from happiness. Be careful what you show the world. You never know when the wolf is watching. I feel a strange sensation brewing inside of me. It tickles my throat and forces my lips into a grin. Before I can stifle it, I giggle. And then I laugh.